The Washington Craft Show returns to the Walter E. Washington Convention Center for its 23rd year November 19-21, 2010. “Giving Back on Friday – Help for the Holidays,” is a new and exciting program in support of worthy causes in the greater DC area and that’s exactly what's planned for the evening of Friday, November 19 from 5-8pm. 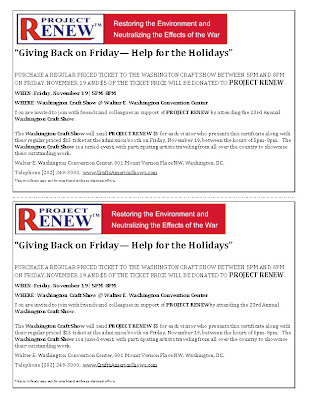 You are invited to join with friends and colleagues in support of PROJECT RENEW by attending the 23rd Washington Craft Show. Here's what to do: Purchase a ticket to the Washington Craft Show. 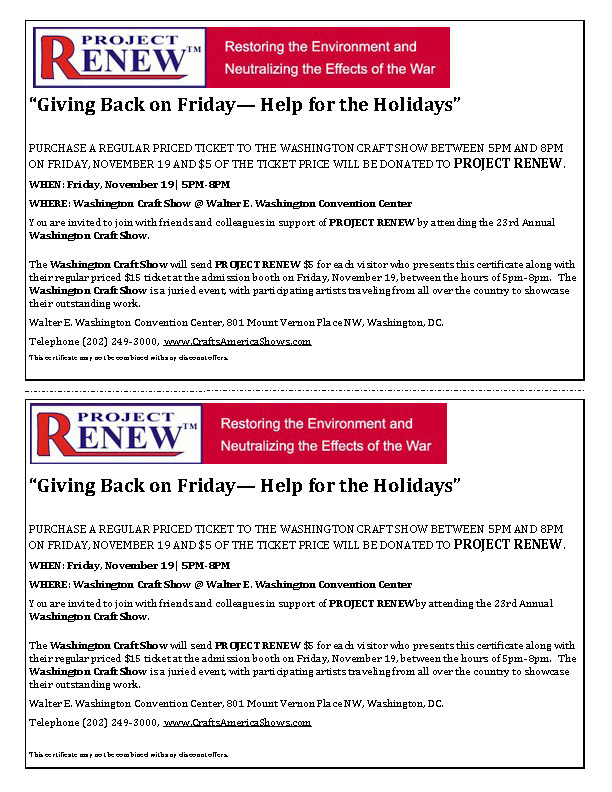 The Washington Craft Show will send PROJECT RENEW $5 for each visitor who presents this certificate along with their regular priced $15 ticket at the admission booth on Friday, November 19, between the hours of 5pm-8pm. Let’s get lots of people in to support this wonderful group on Friday night. We all would like to see thousands of certificates in the ticket boxes, and I encourage my readers to invite your friends and colleagues to help give something back to the community this holiday season! Come out and see some great craft works! Print the certificate below and bring one along for each of your friends. Feel free to forward this easy way to give for the holidays to as many of your friends and colleagues who would enjoy it! A premier event of contemporary craft in America, the Washington Craft Show presents masterful work, beautifully displayed. Each piece is one-of-a-kind or limited edition in a range of prices, all designed and crafted in artists' studios across America. At the Washington Craft Show, you'll find 190 of the nation's top craft artists offering work in a dozen media, each unique and many one-of-a-kind. Each piece represents an inspiring facet of the American spirit—and an enduring treasure, transmitted from the artist's hands to yours. Fri. Nov. 19, 10 a.m. - 8 p.m. Sat. Nov. 20, 10 a.m. - 6 p.m.
Sun. Nov. 21, 11 a.m. - 5 p.m.
1:00pm: Kelly Conway, Curator of Glass, Chrysler Museum of Art. Panel discussion with Matthew Fine, Charles Savoie and Tim Tate. 1:00pm: Bob Devers, Corcoran School of Arts Ceramics Department. Panel Discussion with leading experts in the field of American fine craft. In an effort to reduce the threat of lethal remnants of the Vietnam War, the Vietnam Veterans Memorial Fund initiated Project RENEW, a cooperative effort between the Memorial Fund and the Quang Tri Province People's Committee, aimed at Restoring the Environment and Neutralizing the Effects of War.